I got some info from Lauren with EVERYWHERE that Rick Bayless will be in San Diego this week to do a demo and book signing at Macy's Mission Valley Home Store. Get your reservation in if you plan to attend since space is limited. Following is the info sent to me. Top Chef Master Rick Bayless is doing a free cooking demo and book signing at Macy’s Mission Valley Home Store in San Diego. So did summer decide to greet us early in sunny San Diego? Warm weather calls for a light refreshing mid-day snack. I finish work most days around 3pm so dinner time usually falls around 4pm and by then I'm not looking for a snack. I want a hearty meal! But I do like to enjoy this on a lazy weekend when I'm not feeling all frazzled with having spent 10+ hours in front of a computer. This light snack came to me one day as I stared at the contents of my fridge/pantry and was feeling too lazy to hop in the car and grab something from the market. Not too shabby for slapping something together to qualm hunger pains ehh? 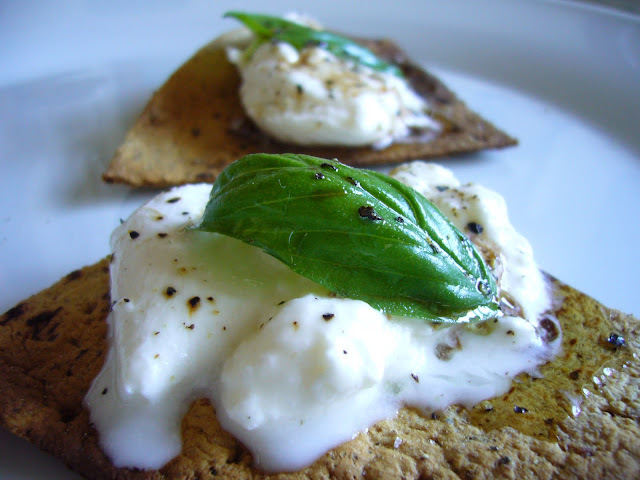 The flavors of buttery creamy burrata, fresh ground pepper, Mediterranean sea salt, fresh basil leaf, aromatic white truffle oil and slightly spicy balsamic vinegar over a crunchy chip is quite tantalizing on the tongue. Hope you get to enjoy this as much as I did. 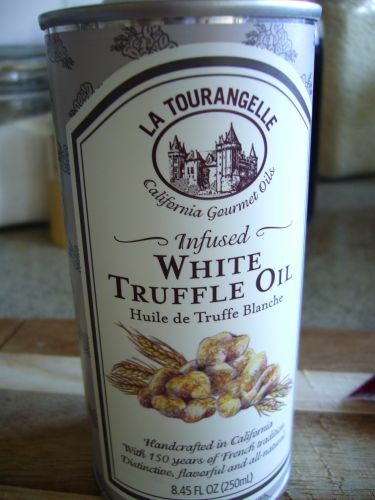 Picked up the White Truffle Oil from Whole Foods. 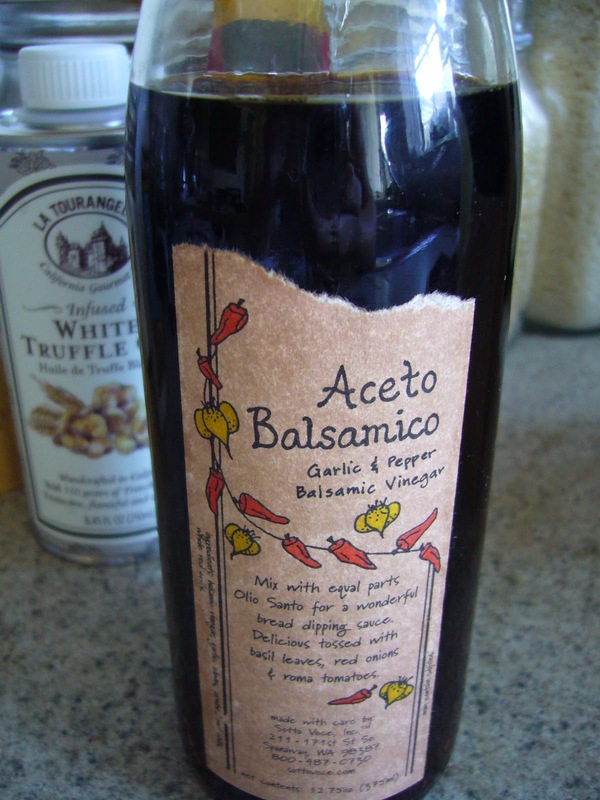 Never fails to make that great dish just a little more special. This Balsamic vinegar came from a Sotto Voce stand across from Pike's Place in Seattle. It's amazing for salads or dipping. 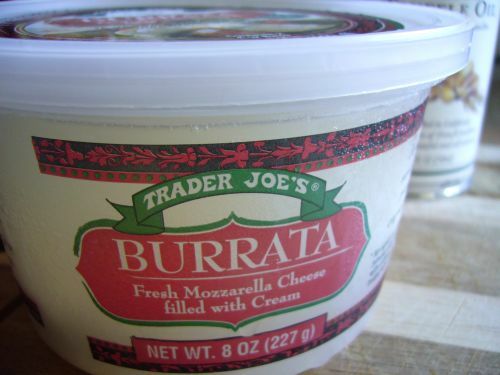 I had picked up some Burrata from Trader Joe's the other day. For those of you with a ravenous appettite or a small army to feed, I have seen it at Costco lately. I believe its sold in a tub of 3 plump buttery balls for $6.99. 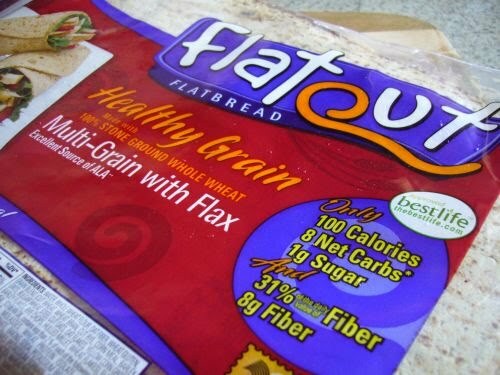 Oh these are my favorite go to wraps. Healthy and tasty at a decent price of $5.99 for 18 wraps (3 individual packs of 6 wraps) at Costco. Not to mention they keep very well in the fridge so no rush if you get tired of eating them. A few weeks ago I headed back home for the most important holiday of the year. Nope it isn't Thanksgiving or Christmas.... it's Chinese New Year! This holiday always brings back a flurry of warm memories from my childhood as well as create new lasting memories. Family, great food, visiting the temple and relatives, oh and who can forget the all important red envelopes? The food for this holiday has always been a feast and we made everything from egg rolls, fried noodles, steamed fish and chicken to even banana wrapped sticky rice...except for the bbq meats. My parents claim that the last time they ordered a whole suckling pig to gorge on was for my 1st month birthday since I was the first born. Don't I feel special? No that's a lot of pressure. Being born first and a girl into a Chinese household is not an easy task. Why do you think I ran to sunny San Diego the first chance I got? Kidding. To commemorate 2 kids out of school and shoved into the "real world" with one more soon to come and the little one entering high school... my parent somehow got it in their mind to get a whole suckling pig this year. What were they thinking? We are a small family of 6. I saw the photos from my birthday celebration. The pig could feed a small village and thats what showed for the event. How were 6 people going to even make a dent in this here pig? Did I say I regret them bringing home this magnificent beast from the deli by Lion Plaza market? No! The aroma was like perfume to my nose and believe me it was terribly difficult waiting to dig into this little piggy while we made the proper offerings to deities and ancestors. The crunchy amber red skin beckoned at me to just snap off a piece but I had to be good. After what seemed like an eternity we finally gathered around the table to feast on this pig and the other delectables we had prepared in the morning. I decided to try out the face but it really wasn't crunchy like I had hoped... it was actually a little chewy. So I set my eyes on a rib next. No disappointment! The meat was tender and well seasoned. The skin was irresistibly crispy and crunchy. It was a shame we couldn't really make a dent in the overall amount of this pig when it was all said and done that day since it just doesn't taste as good as it ages. My favorite roast pork still remains Warung Babi Guling(roasted pig) Ibu Oka in Ubud, a town in Bali, Indonesia. Oh goodness, I still have fond memories of this roast pork I tasted last summer. Was it worth the flight? Yes! Would I go back again just for this? Yes Yes!! Our trusty guide actually happened to live in this town so he was very aware of this joint in which the locals and tourists alike clamored for a tasty meal on the cheap by American standards. Ubud is an hour away from Legian beach where my lady friends and I had rented a quaint villa in town for our stay. We felt very fortunate to find a driver who was very knowledgeable and spoke pretty good English to take us around the island and show us around his hometown. Sorry we didn't arrive when a pig was getting pulled out so I wasn't able to get a shot of a pig not cut up yet. I decided to get the special which came with soup, some rice, a few cuts of meat, a few slices of skin, what looked to be water spinach and a drink. The meat wasn't bad. It wasn't as tender as I had hoped but quite flavorful. What really caught me was the skin. Looking back... I should have just had one big order of skin. Hah! I don't think my tummy would have been happy with me after but seriously. This glassy looking skin was amazingly crispy and crunchy and seemingly had no fat like it had been rendered off. It was like eating thick kettle chips I kid you not. MMM.... skin.... I know some people would be kinda grossed out to eat so much skin but it was just so incredibly flavorful and had an amazing crunch. If it weren't for my fullness, I probably would have gotten that extra order of skin. I actually had contemplated ordering togo to snack on the ride back but I figure it just wasn't going to taste as good. Sides, coming back for the pork would be a nice excuse to come back to Bali. We had some pretty amazing tropical fruit on the island and mangosteen was definitely up there. We kept on eyeing it on the table we sat at but didn't partake. It wasn't till we had left that our driver informed us that these fruits were gratis. Darn!